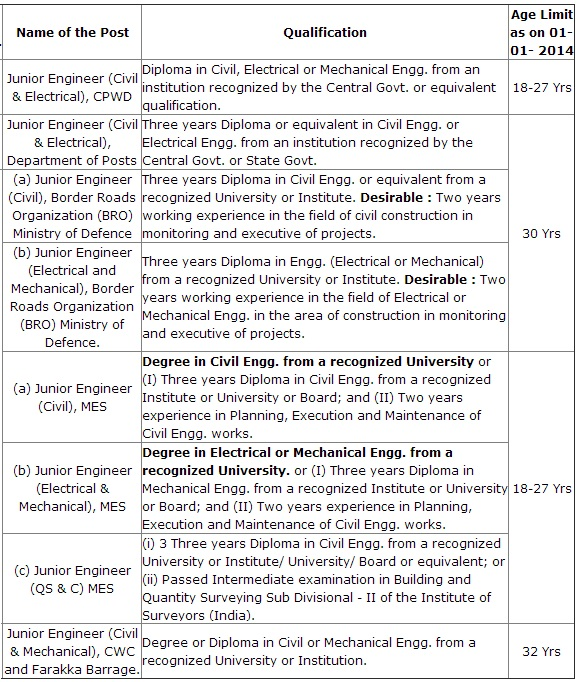 Staff Selection Commission (SSC) has invites application of Junior Engineer (Civil, Civil and Electrical, Electrical and Mechanical, QS and C, Civil and Mechanical) in various departments. Eligible and interested candidates can apply online on or before 28 March 2014. Application Fee: Candidates have to pay Rs.100/- through State Bank of India either in the form of Challan or through SBI net banking and no fee for women/ SC/ ST/ PH/ EXS candidates. Last Date for Submission of Online Application of Part- I: 26 March 2014. Last Date for Submission of Online Application of Part -II: 28 March 2014. Last Date for Submission of Online Application of Part -I for candidates in Remote Areas: 02 April 2014. Last Date for Submission of Online Application of Part -II for candidates in Remote Areas: 04 April 2014. Date of Written Examination: 25 MAy 2014.